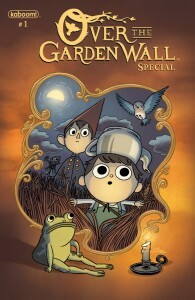 During the initial run of Cartoon Network’s highly-rated fantasy miniseries Over the Garden Wall, Kaboom! Studios ran a single-issue comic-book tie-in. Now series creator Pat McHale (who also worked on Adventure Time, of course) has announced that Kaboom! will be publishing a new 4-issue comic book mini-series, coming in August. Once again it’s written by Mr. McHale and illustrated by Jim Campbell. That means not only more adventures with the human kids Wirt and Greg, but also their talking animal friends Beatrice the bird and Fred the horse — and a dancing frog or two, likely. “The new story is set between the third and fourth episodes of the animated series, with the synopsis explaining, “Wirt and Greg are trying to hitch a ride out of schooltown but end up having to walk. Soon, they come upon two girls playing, and wind up having to keep them entertained so that they don’t wake their giant of a father! '” Check out the interview with Pat McHale over at Hero Complex. I hope they re-release that original comic, finding it these days is both difficult and expensive. Also hoping this increases the chance of the show being released on dvd, I would instantly add it to my collection.